Dear #EthiTweeps: Am I Still Going to Las Vegas #SCCEcei? Heck Yeah! 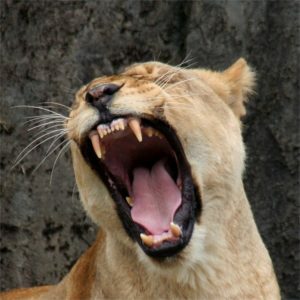 #ROWRR! By way of context, all of my family and close friends know what a Risk Geek I am. Many of my mom friends and the teenagers/young adults in our circle are accustomed to receiving my series of “Travel Updates from the Home Office” that cover a motley mix of topics such as carnival rides, swimming in fresh water rivers, lakes or water parks in warm months (brain-eating amoebas) New Year’s Eve e.g. Times Square and ferryboats outside the U.S. – and, ironically, large outdoor concerts and festivals e.g. Oktoberfest or Christmas markets) Some of you may have heard the story of my oldest daughter who was in Shanghai on New Year’s Eve 2014 when at least 36 people were killed in a stampede on the Bund. When she finally responded to my worried texts, she told me that she and her friends had been in the area of the stampede, but had decided to leave early because of the large crowd. Of course your Risk Geek likes to think she had taken my Home Office #74 memo to heart and ushered her friends out of there just before the stampede, but who knows? Let’s just say that the Home Office continues to publish! “People from all over the world come to Vegas to play, to act in ways they never would at home, and to explore the world of excess. There is another contingent that comes here—those who put their lives on the line so that others may live. Vegas is a Mecca of tactics and thought-provoking innovation in this constantly evolving world. Operators from every organization come to share thoughts, ideas and capabilities with Vegas Metro SWAT, and there is good reason. In the community of non-federal law enforcement, the LVMPD’s Zebra Unit is without a doubt Tier One. Their absolute commitment to excellence is unparalleled; men train and wait years for a coveted spot on the team. Some of the instructors have been with Zebra for more than 20 years operationally. Reading about these security conferences, it’s encouraging and confidence-building to know that our SWAT and law enforcement trains, educates and shares best practices just like another profession we know! I just hope their quality of educators and staff are as fabulous as our devoted and ecpert SCCE conference experts! (WAIT, is THAT where ROY is going?? #JK) I will update this column on Twitter if anything changes in my analysis. I’m sure many of you who have lived and worked in the NY metropolitan area have your own 9-11 stories to tell (I was conducting Day 1 of a two-day team-building and training conference with one of my very first compliance teams which I had named my company’s “Export Council”), but you will all be able to attest to the notable security changes that occurred after that terrible event. Pre 9-11, I still remember being able to walk into any office building – including the World Trades) with absolutely no security checks, other than the individual receptionist desk in each respective building). I believe we will see similar evolution in Las Vegas, which has been long-viewed by experts as a prime terrorist target due to its inherent risk profile. How much longer can hotels and casinos operate without airline-like security checks and bag checks after this? After the Manchester bombings in the U.K. I said the same thing about large concerts and festivals, and I hate being right about that. Along those lines, I think we can expect to see bulked up security at hotels, casinos and all Vegas venues, which I would expect to include large numbers of plainclothes law enforcement. Or as my husband says:”Las Vegas will be safer than ever before.” Yep, Home Office agrees. After Hurricane Harvey, it was so hard and heart-breaking to read so many media stories of destruction and suffering, (especially dogs abandoned by their owners-who I would pay good money to meet some day) that I decided to start a hash tag #HarveyHeroes, focusing on sharing stories of kindness and heroism in response to the destruction and suffering. I found that stories of neighbors in rowboats and folks coming from other states to rescue man and beast were inspirational as a reminder of the perseverance and generosity of the human spirit and the American Spirit in the face of such unthinkable destruction and suffering. So thank you #EthiTweeps for helping me spread that hash tag- because a few days later I saw that it had caught on, and it was joyful to see the focus on these positive stories take hold, With the relentless media coverage we are already seeing on the Las Vegas shootings, I feel a #LasVegasHeroes Twitter campaign coming on! #EthiTweeps, who’s with me?? I’ve already spied a report of young people without shirts and coats on, because they had stopped to use these items of clothing to help the wounded stop the bleeding and form tourniquets! #HeroesAll! #That’sWhatI’mTalkinAbout! I saw a report citing the Israeli approach of getting back to normal operation as expediently as possible after a terrorist attack-to let their population know life had not changed and to give them confidence in the face of evil terror attacks. The Israeli response to a mass casualty event is to quickly erase all traces- including this one gory vivid detail=> carefully wiping blood off of affected leaves and plants. No evil-doer deserves to think or perceive that they have changed or restricted a way of life! I remember our resolve as a country after 9-11 – do you? Our country came together in defiance and strength to help and comfort each other as a united people, And also in Paris after their horrific terror attacks in November 2015 that took 130 innocent lives, resilient Parisians refused to cower inside their homes and filled the streets and outdoor cafes once again, living their lives as joyfully as before. Joie de Vivre! My British friends and colleagues tell the exact same story about their era of NRA bombings and feared Blitz bombings during World War II. 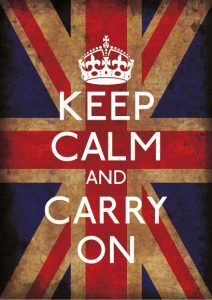 Thus the origin of my favorite British motto: “Keep Calm and Carry On” (a poster created by the British government in 1939 to bolsyer the morale of the British public in the lead up to the war) that is so relevant to #EthiTweeps and CCOs/compliance professionals of all stripes. On this point, like after 9-11, even as more details are revealed about the Las Vegas massacre, let us all remember that we are Americans, we are united by the American Spirit of self-determination and independence. And we are a people of strength, perseverance and resistance! We will keep Calm and Carry On! So Yep, my dear #EthiTweeps, our Home Office analysis has now cleared our trip as planned, and I view it as our civic and professional duty to carry on, get trained up and fully networked, and celebrate our peers at the #SCCEcei! #SCCEStrong! [But proviso: My only adjustment so far? Sorry to my good friend Ben diPietro=> although we may have reached out to you about the Elton John concert, that’s no longer on the Home Office approved list!] Because, Unity, Kindness, Courage and Resilience Will Defeat Evil!! See you in Las Vegas, my friends! #ROWRR! 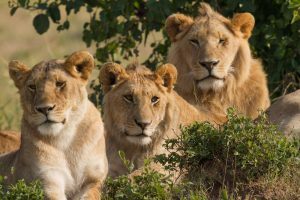 #LionsAll!